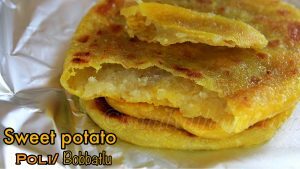 Sweet potato poli/ bobbatlu/ holige is a very delicious stuffed treat which can be made during festivals like ugadi. 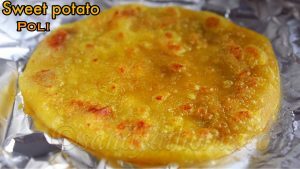 Sweet potato poli is a very healthy and tasty recipe where the sugar quantity is least as all the sweetness comes from sweet potato. 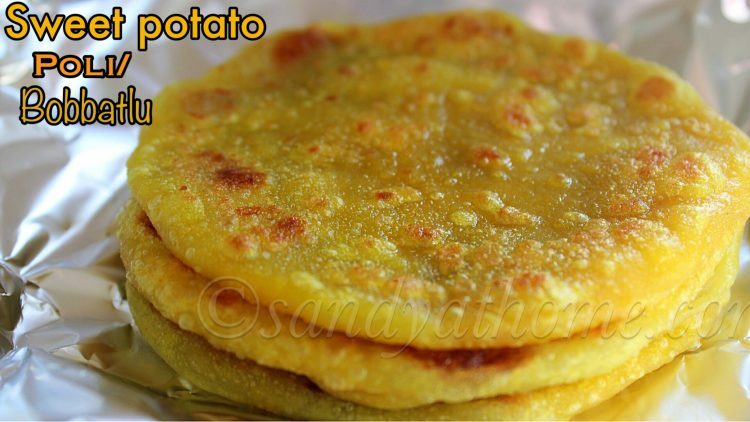 Sweet potato poli is prepared by stuffing sweet potato mixture in maida dough and cooked on tawa with ghee. 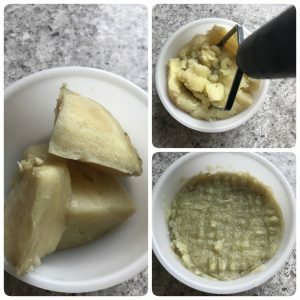 I was thinking of some different recipe to make with sweet potato unlike the regular recipes from the time I harvested it in my home garden and my mom reminded of this toothsome recipe which I made years ago. 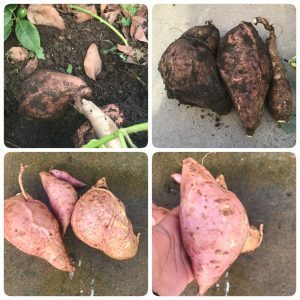 So I am sure my blog is going to hold lot of sweet potato recipes as I harvested 2 giant sized sweet potatoes and 1 medium sized sweet potato. Well I am really thankful to mother nature for blessing us with lot of veggies last year and I am glad that the very first sweet I made was with homegrown ones. 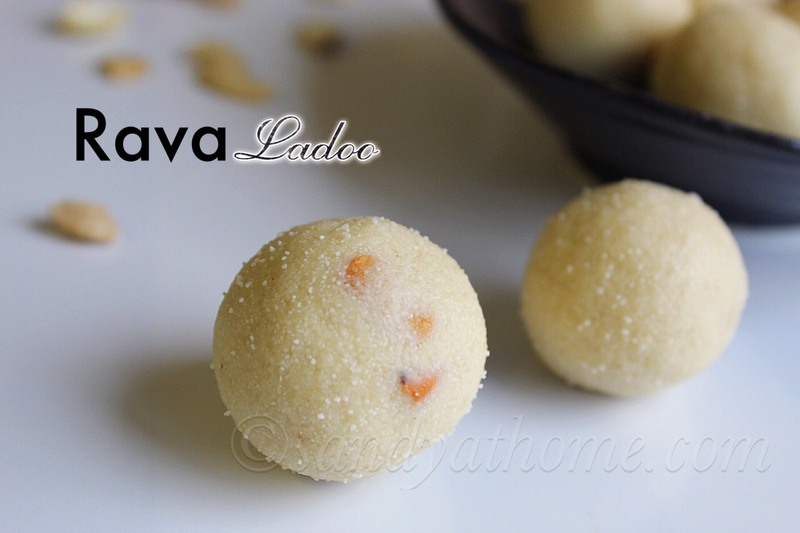 Now coming back to the recipe, the below recipe is made with sweet potato and sugar instead of jaggery as I am not a big fan of jaggery and I also cut down coconut since my mother said it was optional. 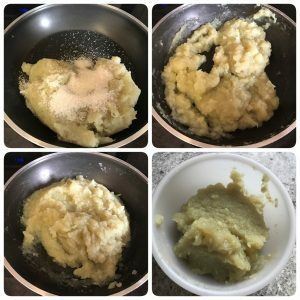 I used very less sugar as my sweet potatoes were very sweet so alter the quantity of sugar/ jaggery according to the sweetness of sweet potato. So lets get to the making! 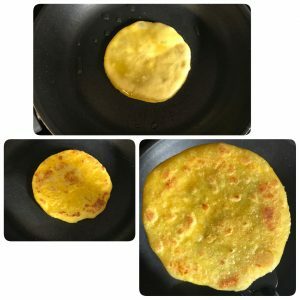 HERE GOES THE FIRST RECIPE FOR THE YEAR 2017! 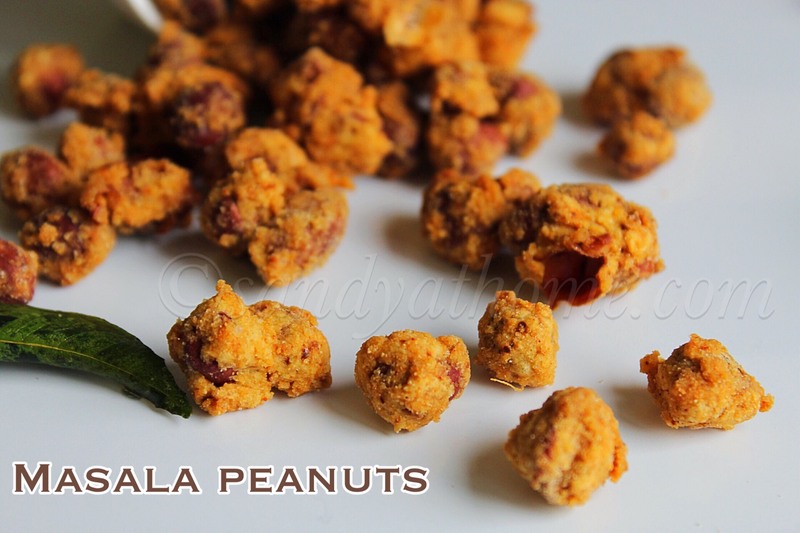 In a wide bowl add maida, turmeric powder, pinch of salt and 1 tsp oil. Mix well. 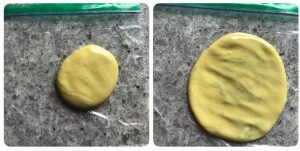 Now add water gradually to a form a soft dough. After kneading dough add 1 tbsp oil to the dough and apply it well to the dough. This helps in making the dough more soft. Allow the dough to rest for atleast 20 minutes. The more the rest time the more better. 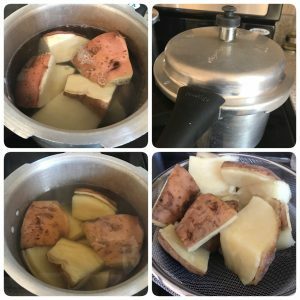 Now wash and cut sweet potato. Pressure cook in water for 2 whistles. When the pressure has subsided drain the water and allow the sweet potato to cool down a little. When the sweet potato has cooled a bit discard the skin. Now mash the sweet potato well in a way not even a small chunk should be left. Now transfer it to a bowl and allow the mixture to cool down completely. When the sweet potato mixture looks firm you can start making poli/ bobbatlu/ obbatlu/ holige. 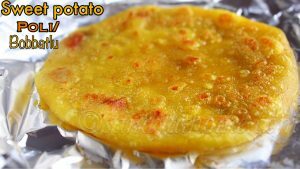 Place small quantity of sweet potato mixture in the center of the dough. Now pleat the dough by joining all the sides to the center. 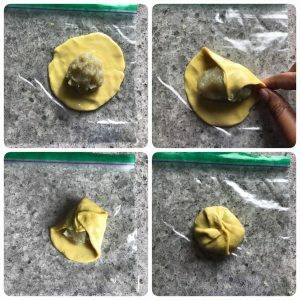 Flip the stuffed dough. Now start flattening it gently with you fingers to make medium sized poli/ bobbatlu. 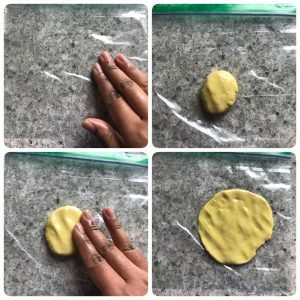 (You can grease your fingers with oil for easy flattening) Make sure to press gently so that the stuffing does not come out and is spread evenly. 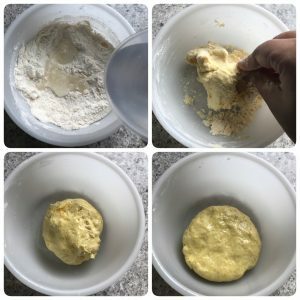 Repeat the process till you finish the whole dough and stuffing. 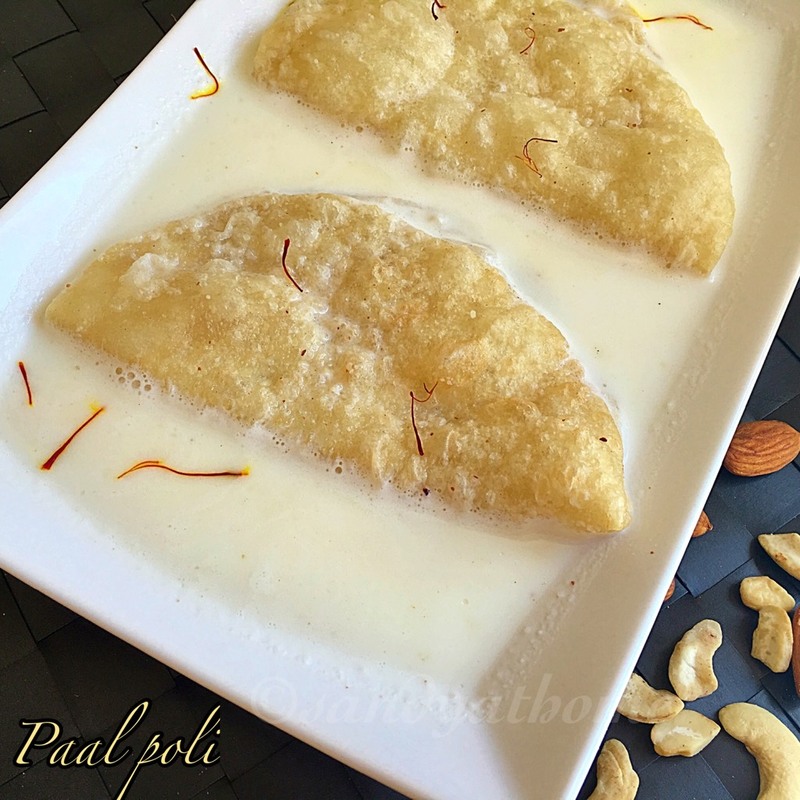 Now gently remove the flattened poli/ boobatlu from cover and place it on preheated tawa. Drizzle some oil around it and cook in medium flame. When you see brown spots on one side flip to the other side and cook till done. Serve it your family and friends.